Songbook is a plugin for browsing your abc song files and playing them with a click of a button. The plugin consists of two parts, an in-game plugin which displays the song library, and an external windows program that generates a list of your abc song files in a format that the plugin can read. The external program is realized as a HTA file (VBScript) so that it's fairly easy to check for safety. Complimentary multi part abc file, Oolannin sota! Optional song parts display which can be used to view and directly select parts. If you have upgraded from a previous version, you probably have to run the songbook.hta file before your song library works again. See instructions below. IMPORTANT - Before loading the plugin, use the supplied songbook.hta file (or this native windows application) to build your library. Double click the file to run it, or just make a shortcut to it and place it anywhere you want. Run it whenever you have made changes to your song library. You can also use a great tool by Arnhor, especially if you have problems with building being slow. To load the plugin type /plugins load songbook. Click M button to toggle music mode (make sure you have an instrument equipped). Select a song by clicking it and then press play button to start playing. There's also buttons for synced play and making a ready check. Click and drag from the bottom right corner of the window to resize it. Click and drag the title bar to move the window. Closing the window will save its position and size. Drag the separator lines to scale the sizes of directory, song, and part lists. If the song has multiple parts, you can click little arrows next to the part number ( marked X: ) to switch selected part. Answers to commonly asked questions can be found here. Songs with special characters, such as accents, in their file names will not play with the plugin. This seems to be a problem with the plugin API. French and German text fixes, big thanks to Lya for helping out! Rest of the version history is in the readme file for those interested. Here's an updated version of the song discover script for Linux / MacOS. Download the script from here. Save the file into your Plugins/Chiran folder (the same folder where Songbook.hta resides). You can try double-clicking the script, and it may work depending on your system settings. perl "/home/username/The Lord of the Rings Online/Plugins/Chiran/discover_songs.pl"
I had a similar problem, the script for building the library seemed to not work for me, it looked to me like it cant change from the default folder. I have game installed on ssd and but home folder and thus plugin data on hdd. If i remember correctly, i solved my problem by hardcoding my own path into the library builder. 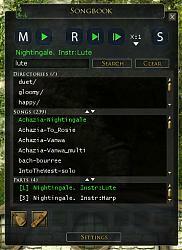 ...gs Online\Plugins\Chiran\Songbook\SongbookWindow.lua: 43: Unable to parse file! Looks like there is a problem with the script. Please run the script again and copy+paste the output into a PM and send it to me. Also, send me the SongbookData.plugindata file (you can either upload it to my Google Drive, or use another sharing service and send me the link). In the meantime, you can try adding "}" to the end of the file until the error message changes or goes away. The script should have asked you where your PluginData folder is; that might be a bug. Tried both, but nothing seemed to happen. I'm not sure what I'm doing wrong. What do you mean by "nothing happened"? Did you get an error message? perl "~/Documents/The Lord of The Rings Online/Plugins/Chiran/discover_songs.pl"
If not, let me know the error message. Last edited by Thurallor : 06-28-2018 at 05:39 PM. Try the Perl script I posted below. Or, if you're not comfortable doing that, try the Mac version I linked below. I'm a long-time fan of this plugin, but have recently switched to using Linux from Windows and can't seem to get neither the songbook.hta nor the songbookfiller.exe files to populate my music library. I simply click on them and nothing happens. In-game, Songbook opens up and does everything it should - I just can't populate my music library with songs. I'm using Linux Mint 18.3 and have been able to get everything else having to do with LOTRO to work perfectly. Is there anyone out there who can lend some assistance? It would be greatly appreciated! I just transcribed a song in musescore. Saved it as a midi file. Went in to Maestro and turned it into an .abc file. It plays in Maestro and abcplayer. In game using the plugin, I get the message Couldn't find tune index in song file. First time in 6 years I have seen this error message - ideas? There's probably some parameter missing from abc notation. Perhaps it is the X parameter which identifies instrument track index. So if there are multiple instruments in the same file, then each has its own index. And even if there's only one, it should be still present. Last edited by Chiran : 03-05-2018 at 06:48 AM. If you post the .abc file here, I'm sure someone will figure it out in short order. 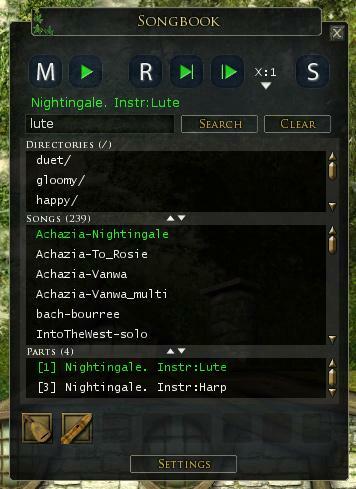 My husband would like to know if it is possible to get more shortcut slots in songbook as he can't put one of each instrument type on the bar? There is a button in settings page that allows you to add more shortcut slots. I don't remember if there was any hard limit, but you should be able to fit quite many if you make the window wider.